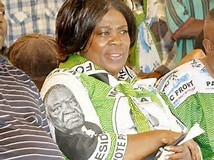 Minister of Lands and Natural Resources Jean Kapata, working in league with the Central province administration and Kabwe Municipal Council have interfered with the investigations involving several PF cadres, PF councillors and several senior government officials who have been illegally selling land in Kabwe. Earlier this year, PF Secretary General Davies Mwila, while in Kabwe told PF cadres to ensure that they get themselves huge chunks of land and further directed the PF controlled council to ensure that PF cadres were considered in allocation of market stalls, land and other incentives before considering others. This statement is said to have triggered the sense illegal land dealings within the party hierarchy. In June this year, the ministry of lands suspended the land agency from Kabwe Municipal Council – KMC following rampant illegal land allocations, while in 2014, security agencies obtained a list of the councillors directly involved in these illegalities but have been blocked from instituting arrests. Early this month, PF Chimanimani ward councillor Frazer Makaliki was arrested for a land deal that went sour because even provincial minister Sydney Mushanga had interests in the piece of land under dispute. When Kapata arrived in Kabwe yesterday, she was taken round the affected places and was to hold an open meeting with members of the public at the Boma hall but after learning that most of the culprits were PF cadres, senior government officials she decided to have an indoor meeting with only the PF cadres and councillors and the involved civil servants. All journalists were asked to leave the meeting but the Watchdog reporter who disguised himself as a PF cadre remained inside the hall and recorded the full proceedings, in fact even Kapata herself is a beneficiary of this corruption. And after the closed door meeting which exposed the PF land maniacs, Kapata as usual issued a blank statement that the erring officers will be arrested. Conspicuously missing at the meeting was PF Kabwe Central MP who has also been categorically speaking against land illegalities and has been defending victims from the land sharks.